JUBA, Southern Sudan—I recently had the chance to speak by phone with Amjed Farid, a young student activist involved with the Girifna movement in Khartoum. As a participant in this movement, Amjed shared some of his thoughts on the goals of Girifna and on Sudanese politics today. He asked me to use his real name because he said that he and his fellow activists are tired of living and working in secrecy. “You are not down [or defeated] when you are fighting, and we are fighting,” said Amjed Farid, 27, a young doctor and activist who joined Girifna, an organization formed in Khartoum in October 2009, before the start of voter registration for Sudan’s upcoming national elections—the first multiparty polls the Sudanese people will have participated since 1986. Girifna literally means “we are fed up” in Arabic, but colloquially it is akin to “we’ve had enough.” Over the past several months, Girifna has mobilized citizens in Khartoum and in other northern states to stand up and exercise their right to vote as the first step toward genuine political reform in Sudan. A pragmatic view of the political realities of Sudan is at the heart of Girifna’s efforts. According to their website, Girifna was formed “on the eve of voter registration,” when three activist friends in Khartoum realized that “Sudanese citizens had no information about where to go to register and no national campaigning by the government or civil society groups was taking place.” They decided to form an organization to educate Sudanese citizens about their rights as voters and to urge their fellow citizens to take part in the upcoming elections as part of “a peaceful quest for change” in Sudan. While Girifna activists found that conducting civic education and voter awareness was a good start, they ultimately decided to “take the idea to a more advanced state,” according to one activist. In the aftermath of the registration process, members began doing everything from working with lawyers to file legal claims about violations that occurred during the registration process to working through various channels to attempt to allow Girifna members to participate as domestic elections monitors at polling stations during the elections. Since the Sudanese government considers Girifna to be an “illegal” movement, members are applying (through national NGOs) to the National Elections Commission to be domestic monitors, and they are also organizing “public monitoring” programs modeled on the monitoring efforts they employed as students participating in the student government elections at their universities. Some Girifna activists claim that they don’t have a political agenda, but are simply fighting for democracy and political freedoms in Sudan. 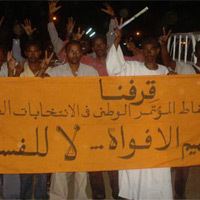 While Girifna does not support one particular opposition party, it does take a firm stance against the ruling party, calling resolutely on the people of Sudan to vote the NCP regime out of power (one of the reasons Girifna members claim the regime has declared the activist movement to be “illegal”). In mobilizing support to challenge the National Congress Party in the upcoming elections, Girifna is working for a major shake-up of the political order in Sudan. As a result, the group has exposed its leadership and members to the often brutal whims of Khartoum’s far-reaching security apparatus. This network— which includes the notorious National Security Services, or NISS—is sanctioned by a repressive legal framework to take severe measures to limit the ability of opposition movements to operate freely in Sudan. On March 4, security and police forces in Khartoum halted a peaceful election campaign led by Girifna. Three Girifna members were arrested and taken to a police station in Khartoum. According to the African Center for Justice and Peace Studies, or ACJPS, the activists were charged with “causing ‘public noisiness’” under Article 77 of the Criminal Act of 1991, one of the laws that enables Sudanese security forces to crack down on movements or individuals that threaten the Khartoum regime. Farid said that this was one of dozens of arrests of Girifna members over the past months, but that this particular incident likely received more press because they were a large group gathered in a public place and one of the three people arrested has both Sudanese and American citizenship. On March 14, an 18-year old student was interrogated, beaten, and detained overnight in a Khartoum jail after undercover security officers who posed as Girifna supporters lured him into a conversation, then pulled out pistols and took him away. In an interview with Human Rights Watch following the incident, the student said “They used sticks and pipes to beat me on my back and they put a pistol to my head and pretended to shoot it.” Security forces also recently detained a 65-year old man in the Khartoum suburb of Omdurman who was in the market distributing information about Girifna. Despite the dangers that Girifna faces from its peaceful voter education activities, its members are speaking out boldly, saying that they refuse to live in fear of their government any longer. “We have had enough of silence,” Farid said. Girifna could be a sign of a significant shift in sentiment in Khartoum. Sudan’s post-independence history has been punctuated by popular revolts and military coups that led to changes in power. In early 1985, popular discontent with President Jaafar Nimeiri’s regime led to a coup by a group of military officers. However, Farid argued that this significant political and military change was precipitated by civil society, “not by political parties.” After the medical doctor’s union in Khartoum began a strike, their efforts were multiplied by demonstrations by university students in Khartoum and then by a public strike by some of the powerful trade unions. After people gathered in the streets, the army came to support this effort and to remove President Nimeiri from power and install a civilian government to hold elections; this sequence of events, which occurred in March and April 1985, came to be known as “the Popular Uprisings.” Farid seemed to cite this example to illustrate that when citizens get fed up and have had enough of their government, it is often the students and the young activists who build momentum at the grassroots to take action and generate change. With less than a week left before the Sudanese go to the polls, all that is certain is that the elections cannot be the vehicle for 'democratic transformation' as promised by the CPA. But the Girifna activists are still working–despite the decision to boycott by some of the opposition parties, despite the political machinations between the NCP and SPLM, and despite the clear indications that the NCP has taken all possible steps to rig the elections and hoodwink the international community into accepting the outcomes of these polls. To Farid, Girifna represents “a new hope” for Sudan. He thinks that Girifna could help the Sudanese by engaging them with something that is more reliable than the political parties. “The older generation of politicians have been in power for many years,” he said, and people have lost their trust in the idea that politics can bring positive change. Farid and his fellow members are modeling an ideal of democratic participation that will, inshallah, inspire Sudanese citizens around the country to someday regain hope in the idea that government can be representative and politics can yield real change.